If you are interested in adopting any of these Boston Terriers please fill out the adoption application and send it to the rescuer's address that is listed with the Boston Terrier. Thank you. There is an adoption fee to offset vet costs. 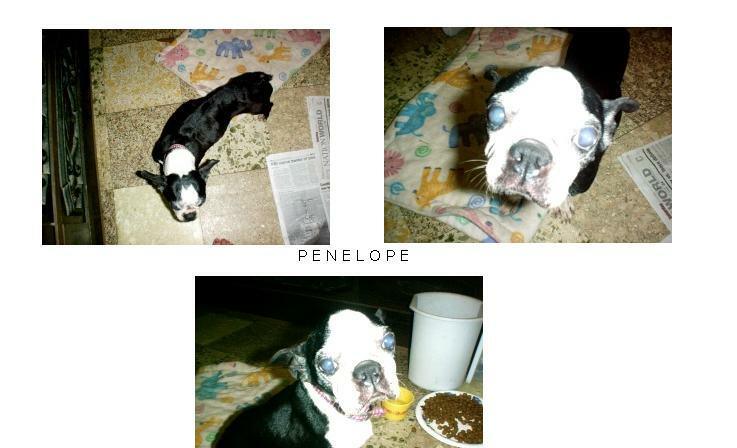 Penelope can now hear quite a bit and her vision is much better than it was when she first got here. She is housebroken(for the most part) up to a full weight of 17 pounds, and LOVES kids and other dogs and cats. She is a great little dog. She should not be with small children all the time because she gets upset when there is a lot of activity around her. A nice quiet home would be best. Please contact Gwen at edertruk@wmis.net for more information!